The M/V American Integrity was originally named the Lewis Wilson Foy and renamed the Oglebay Norton in 1991 after the Oglebay Norton Company. The vessel came under the ownership of American Steamship Company in 2006. 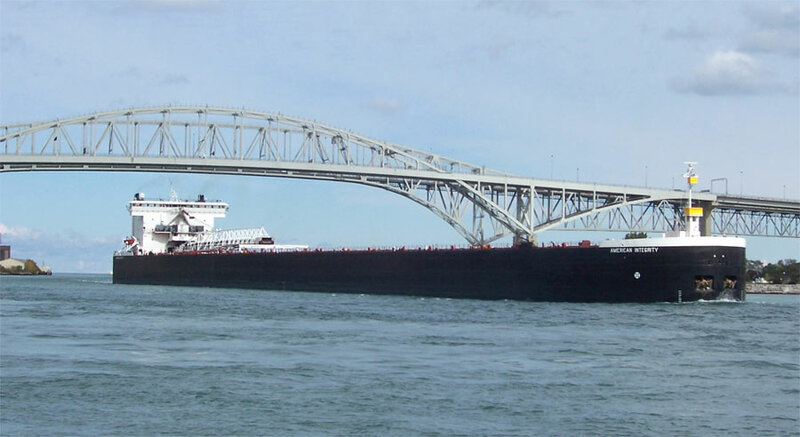 The M/V American Integrity sailed its maiden voyage in ballast from Sturgeon Bay, WI to Superior, WI in June of 1978 to take on a cargo of taconite pellets for delivery to Burns Harbor, IN. The M/V American Integrity was built by Bay Shipbuilding Corp. at Sturgeon Bay, WI in 1978. The M/V American Integrity is powered by four 3500 HP General Motors Electro Motive Division (EMD) diesel engines. The vessel uses a conveyor system below its cargo holds to transport cargo to a "loop conveyor" system that elevates the cargo to the massive deck-mounted boom conveyor. For maneuvering in port, the vessel is equipped with 1,500 HP bow and stern thrusters. The M/V American Integrity is primarily used for long-haul transport of iron ore pellets and western coal on the Great Lakes.